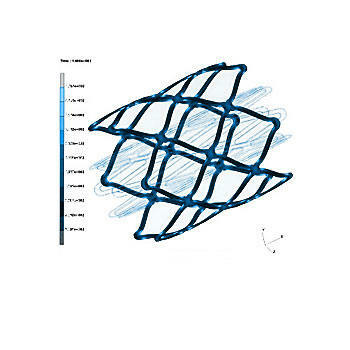 The analysis of coronary stent is carried out to optimize stent designs. On the other hand FE analysis can reduce in-vitro testing for stents. For this problem, the simulation of plastic material behavior has a great significance. In our laboratory experimental and analytical procedures are combined. In the FE model both the mechanical boundary conditions of dilatation and the in-vivo fatigue loading can be simulated. The dilation of the stent in the FE analysis is additionally shown in a short animation.